Despite some doubts and suspicions, the BRI has proven – by personal stories and factual numbers – to be a feasible solution to the most urgent problems for developing countries. 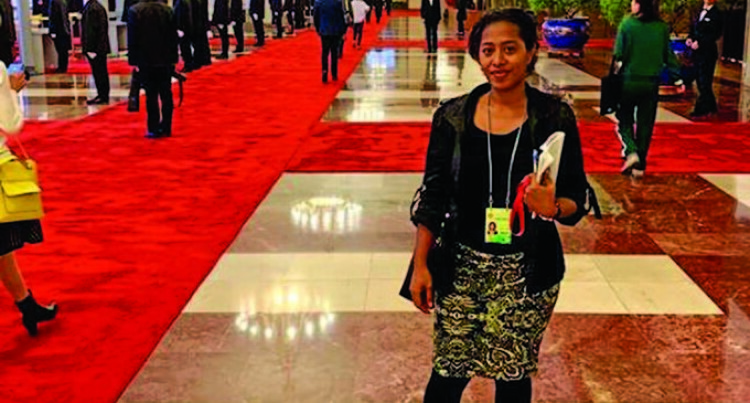 Fiji Sun senior journalist Fonua Talei has won second place in a global essay competition on China’s Belt and Road Initiative. More than 100 writers from 42 countries took part. Ms Talei was one of the six second place winners. The contest was organised by the China Global Television Network (CGTN). It invited participants to share their stories on the Belt and Road Initiative (BRI). Entries came from Asia, Europe, Africa and Latin America. Ms Talei’s essay was titled: Breathing New Hope in Fiji. She is in China as part of the 10-month media development programme based at the China Asia Pacific Press Centre in Beijing and hosted by the China Public Diplomacy Associa­tion. Speaking from Beijing yesterday Ms Talei said participat­ing in the competition was a chance for her to write about the impact that the BRI has on ordinary Fijians through infra­structure development. “I did not think that I would be picked for a prize because we were informed that people from all over the world were participating,” she said. Ms Talei has just returned from Hainan Province where she covered the Boao Forum for Asia (BFA). She covers other major international events, while attend­ing Renmin University, one of the most prestigious in China, and Beijing International Chinese College where she studies Chinese. CGTN judges were happy to share their impressions about the contest and the articles submitted to the jury. Here are their comments. Zhang Yanqiu, professor and director of the African Media Research Center at Communication Uni­versity of China, said this activity was very well designed and organised. “It created an opportunity for CGTN’s international audience, especially young international students, to contribute their own views on the BRI. “Their observations, reflec­tions and recognition of the BRI could be clearly identi­fied in these essays. “Some of the essays were very impressive and touching, actually. “I can see that the BRI has been largely welcomed by these participants, who not only expressed their interest and confidence in the BRI but also shared their expectations,” Mr Zhang said. Nicholas Moore, in­ternational editor, CGTN Digital said the BRI was a pro­ject on an enormous scale, both in terms of ambition and sheer size. “As reporting fo­cuses on political declarations being signed or the bil­lions of dollars be­ing invested, it can be easy to forget that ordinary people around the world are at the center of the BRI. Xia Jixuan, former deputy director of China Ra­dio International said their BRI perspectives and stories were as different as their origins, but their conclusions are similar. He said many participants agree that when they face new challeng­es, they need to work out ‘upgrad­ed’ plans by drawing wisdom from past success while adapting to new conditions instead of resort­ing to old-fashioned zero-sum mental­ity.